Know: Stephen stayed true to Christ and the Gospel in the face of opposition. Think: Have the mindset that the Gospel should be proclaimed, even if it is offensive. Do: Seek to present the Gospel through your words and lifestyle. B1 Acts 6:8, does the words "...full of faith and power..." mean that anyone who is "full of faith and power" can do miracles today? C1 Full of faith means completely believing and obeying God. It does not mean that he is sinless or has some special gift from God. C2 Doing miracles in the first century church is a special gift given to certain people to show that this "new thing," the Gospel, was from God. C3 We can be full of faith today but do no miracles. C4 Stephen had the hands of the Apostles on him when he was ordained to the office of deacon (Acts 6:6). We don't have apostles today. C5 According to Wilbur Pickering, noted Greek manuscript editor, "full of faith" is the wording in 80% of manuscripts while "full of grace" is the wording in 20% of manuscripts. C1 Ray Stedman in his notes writes: The second thing to be noted is that these signs were to confirm the introduction of new things in the church. When the apostles first began to proclaim the gospel of the resurrected Lord it was confirmed to the people by signs and wonders. Now, when the apostles extended their ministry to include others with gifts within the church, it too is confirmed with signs and wonders. The word of God makes clear that these signs and wonders, these mighty miracles, are particularly slanted toward the Jewish mind, and are for the purpose of confirming something being introduced for the first time. They did not continue in the church, and they do not continue to this day. That does not mean that God is not able to do miracles. He can, and does. But they are no longer of the character of signs and wonders. God does work physical miracles today in most amazing ways. But they are no longer of this confirmatory character. These were reserved for the initial experiences of the early Christians, as they introduced truth into the world. B3 Acts 6:8, who are "the people?" This term is used for Israel, the Jews. (Matthew 2:4, John 18:14, 2 Peter 2:1, etc.). Now it includes all who believe as in Hebrews 4:9 and Hebrews 11:25, 1 Peter 2:10, etc.). B4 Acts 6:9, who are the Libertines? Others translate this as the Freedmen. It refers NOT to freethinkers but those who had been Roman slaves in Italy (and elsewhere) who had in various ways become freed. These had come back to Israel and had their common synagogue. B5 Acts 6:9, why did they argue with Stephen? What was Stephen preaching? B6 Acts 6:9, notice "Cilicia." Where was the Apostle Paul from? Could the brilliant Saul have been one of those who could not refute Stephen? Was that why Saul was consenting to his death? (Acts 8:1 [Acts 7:60 in some versions], Acts 22:20) Archibald Thomas Robertson in his Word Pictures in the New Testament comments for this verse are "Was consenting (ην συνευδοκων). Periphrastic imperfect of συνευδοκεω, a late double compound (συν, ευ, δοκεω) that well describes Saul's pleasure in the death (αναιρεσις, taking off, only here in the N.T., though old word) of Stephen. For the verb see on Lu 23:32. Paul himself will later confess that he felt so (Ac 22:20), coolly applauding the murder of Stephen, a heinous sin (Ro 1:32). It is a gruesome picture. Chapter 7 should have ended here." B7 Acts 6:10, who gave Stephen wisdom to answer? Is this possible today? What part do we have in acquiring wisdom? B8 Acts 6:11, “You shall not testify against your neighbor with a false witness." (Exodus 20:16, LEB), what are these "super" religious, self-righteous Jews doing in their accusation? Does this happen today? Has it happened to you? There is something about truth that brings out the worst in unbelievers. 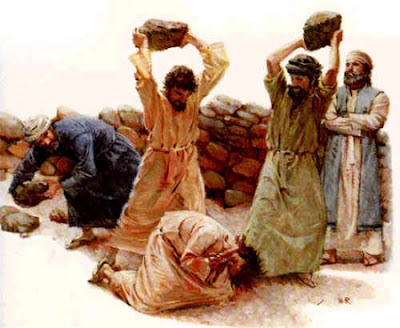 B9 Acts 6:12, what is the underlying motive for their violent acts against Stephen? See "You shall not murder. "(Exodus 20:13 LEB). How do we handle situations when we are unjustly accused and physically abused? Do we hate anyone? How do we handle this? B11 Acts 7:51, according to Calvinism no human can resist God. Is Stephen mistaken in his theology? C1 "O Jerusalem, Jerusalem, the one who kills the prophets and stones those who are sent to her! How often I wanted to gather your children together, like a hen gathers her brood under her wings, but you were not willing! (Luke 13:34 EMTV) These are the words of the Lord Jesus. C2 Many things that God has said are conditional on our response, and some are not. D2 Jesus will return (Matthew 24:30, Revelation 1:7, etc.). D3 The resurrection from the dead (Daniel 12:2, John 5:28-29, etc.). B12 Acts 7:52-53, does the truth get into the listener's soul? Is Stephen telling the truth? Why did they then not repent? B13 Acts 7:54, what does "cut to the heart" mean? It means to saw into pieces. It is a very strong word describing the effect of truth on these people. Why does the truth have this effect on some people but not others? B14 Acts 7:54, what was the reaction of these Jews when they heard the truth? B15 Acts 7:55-56, why did Stephen have this vision at this time? Did he really see Jesus or having a hallucination? What did the Jews who heard it think? B16 Acts 7:57-59, what effects did this vision have on the Jews and Stephen? B17 Acts 7:60, what were the last words of Stephen? B18 Acts 7:60, do the words "fell asleep" refer to soul sleep, the idea that when people die, their soul is not aware of anything? No, it is a phrase for dying as some might say, "S/he passed away," or "S/he's gone," etc. B19 If we might die for telling the truth, should we lie or not say anything? We might say the truth with a soft voice instead of loud and harsh voice, but we must tell the truth. B20 Who was with Stephen through this time? B21 How do the terms "stiff-necked" and uncircumcised affect the Jews (Acts 7:51)? These terms are incredibly derogatory to Jews. See Exodus 33:3-5, Psalm 75:5, Jeremiah 17:23, and Romans 2:25-29. B22 When Christians are persecuted for no reason except that they are Christians, is there anyone who can help us? Who helped Stephen? B23 Who will help you this week?